The $40 million project would widen and restructure a portion of Harvey Mitchell Parkway, making it more accessible to pedestrians and vehicles alike. BRYAN, Texas — TXDot held an open house and hearing on proposed efforts to widen and restructure a portion of Farm to Market 2818 or Harvey Mitchell Parkway on Tuesday. According to TXDot, the project would involve will be widening that portion of the road to six lanes; with three in each direction. The proposal also involves upgrading facilities for bicycles and pedestrians. 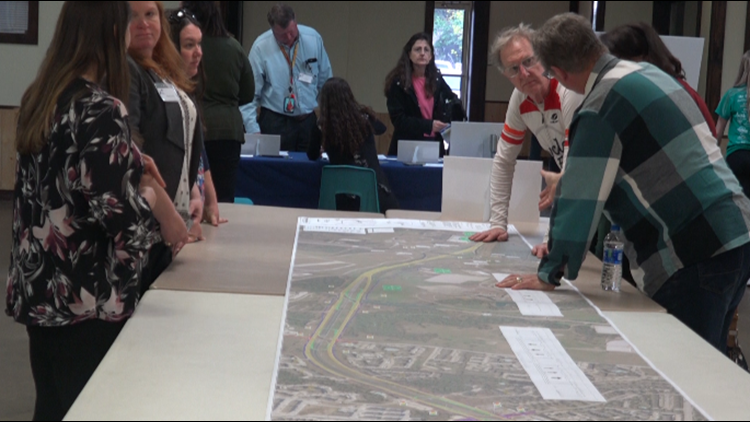 Maps, displays and plenty of TXDot officials were available to the public for any questions they had Tuesday evening. A hearing followed the open house. After officials spoke to the public, people were given a chance to publicly share their thoughts. But for people like Robert Vanbrant, it’s a different story. “From a cyclist, from myself, it’s very exciting. For me and many of my compatriots... We’re trying to get the bike off the road, but be able to get through and commute,” he said. If approved, the project would cost roughly $40 million, and construction would begin in the fall of 2020.